This necklace is the property of the Iziko Museums, the personnel responsible need be contacted. The necklace arrangement of beetles was conceptualised and carried out by collection managers Margaret Cochrane and Dawn Larsen, in the early 1990s, at the Iziko South African Museum in Cape Town, South Africa. They used specimens from a late 1800s collection recently donated to the museum by a person referred to as Volschenk. The specimens had little scientific data (locality information, date and collecting information), and thus were selected as material to create this jewel beetle necklace. Of the data available, it seems that some of the specimens were collected from 1880 to 1887, and that they are from a wide range of geographic locations (Japan, Brazil, Southeast Asia, Europe, China, Russia, Himalayan region, France, Australia, Reunion, North America, South America, Central America, Mexico, Senegal, South Africa and Iran). Rich and jewel-like, with the quality of iridescence that sees variable colours across a single surface, the bodies of these six-legged creatures are very eye-catching. 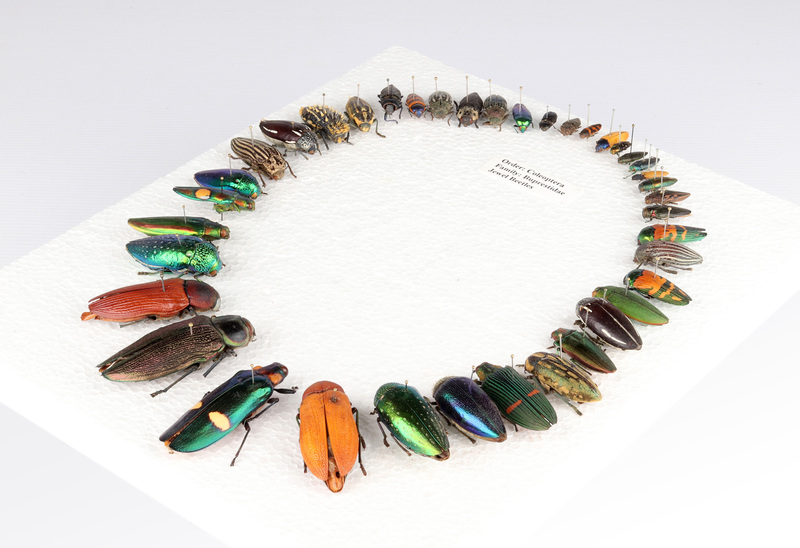 In the entomology collection of the Iziko South African Museum in Cape Town resides an unusual, striking object – a wreath made from the bodies of pavonine jewel beetles. The object is an arrangement of pinned specimens in the manner of a necklace, displaying the variation of the jewel beetle or, in scientific terminology, Buprestidae family across some of its many species, which are found all over the world, from Japan to Brazil to South Africa. The jewel beetle necklace alludes to the use of insects by humans for decoration and adornment. Like the cochineal beetles found on cacti in central America, used to make magnificent, deep pink textile dye, jewel beetles have long been collected because of appealing aesthetic characteristics valued by people. Their wings have been incorporated into textiles, basketry and jewellery. Some of the most impressive beetle wing embroidery is from the Mughal era in 16th, 17th and 18th century India. This and other beetle wing embroidery of various parts of Asia had an influence on the fashion of Victorian England. Victoria Rivers notes that at the Great Exhibition of 1851, in London, there was a white lace dress on display “in which part of the pattern [was] composed of entire beetle wings stitched on the dress in leaf and flower motifs.” A small industry developed in Indian cities in which cloth embroidered with beetle wings was produced for sale to Europeans. According to Maura Flannery, in 19th century Europe the interest in insects as ornamentation became so extreme as to elicit “live beetles tethered to golden chains climbing on ladies’ shoulders.” If not alive, dead specimens were preserved and attached to accessories like hats (millinery), which had become decorative items of style rather than functional pieces of clothing. Michelle Tolini describes “animal-laden” hats and bonnets with assemblages of butterflies, flowers, bird nests, hummingbirds, mosses and beetles such as “preserved scarabs atop coronets of velvet” as millinery trimming. This idea of natural things, like brightly coloured birds, butterflies and beetles, as inspiring body ornamentation and clothing is evident in the contemporary fashion world. The 2018 collection of the fashion house Alexander McQueen serves as a striking accompaniment to the jewel beetle necklace. Designer Sarah Burton has drawn inspiration from the insect world previously in a 2013 collection inspired by bees and the beekeeper. The current 2018 collection has used the patterns of butterfly wings and black and white Goliath beetles to create impressive prints for dresses and coats. The idea of a display of pinned beetles is also evident in tulle dresses covered with row upon row of sequined embroidery depicting colourful jewel beetles. These beetles are also found encrusting boots and bags, and laid out in a kaleidoscopic manner on silk scarves. Both the work of Burton for McQueen and this jewel beetle necklace demonstrate the allure of the wonders of nature as ornament. The use of insects and other animals will be discussed with regards to the worlds of art and fashion through time and across space. The jewel beetle necklace provides a point of entry into these worlds. This object, however, simply gives the illusion of being an item of jewellery. 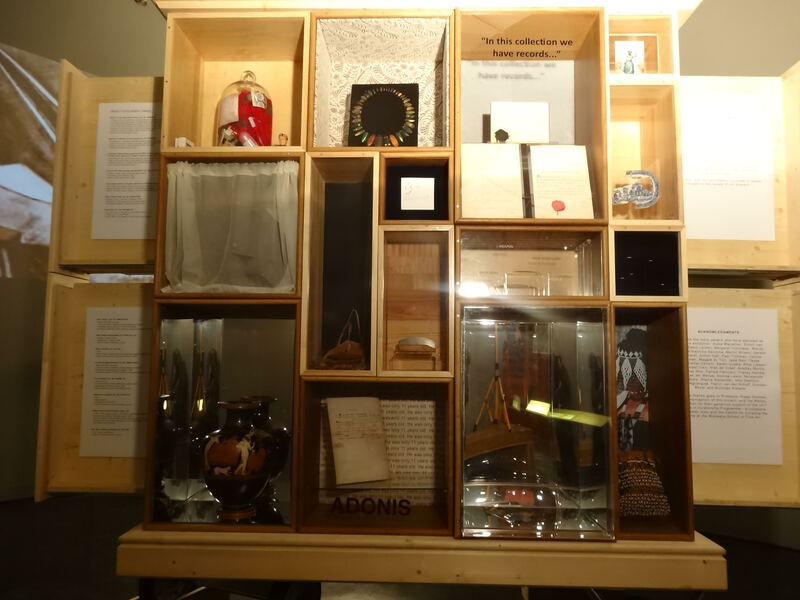 This leads, in one sense, to a discussion of adornment and dress, but also, to that of unconventional displays of scientific ‘specimens.’ Through their manner of exhibition, objects can cross the disciplines of art and science. A necklace is a string of material tied in a loop worn around the neck for the purpose of adornment and decoration. Such items of jewellery can range from simple to elaborate, and be made from common or precious materials. Necklaces are objects that can serve functional, symbolic, spiritual and, perhaps, other purposes. Objects of body adornment that can be classed as ‘jewellery’ are frequently round in design, which enables attachment to the wearer around their body. As such, objects in a rounded formation, of a certain size and nature, may be likened to ‘necklaces,’ and deliberately placing certain kinds of objects in this rounded form can enable the label ‘necklace.’ The object of this brief study is such a ‘necklace,’ not a functional one but ideological instead. Its formation is not the only marker enabling the necklace category, but includes the nature of its components, for it is made of small jewel-like objects, colourful and shiny – the bodies of beetles. Beetles are distinguished from other insects mostly by their forewings, which have become hardened wing cases called elytra. Elytra encase much finer wings beneath, which can unfold for the purpose of flight. The elytra and remaining hard exoskeleton of beetles can display impressive patterns, colours and iridescent effects. The particular beetles that make up this ‘necklace’ are of the family Buprestidae, also referred to as jewel beetles or metallic wood-boring beetles, and their exoskeletons can be brilliantly coruscate and prismatic. The beetles in this display are beautiful to behold, their burnished bodies catching the light, presenting colours that behave unlike those we are accustomed to. For some, this ‘necklace’ is alluring and appalling at the same time, the idea of insects upon one’s body repulsive. Yet the beetles are also perceived as jewels and make a fine impression of precious stones. Thus for others, this is a ‘necklace’ more interesting and dazzling than any other. The Buprestidae beetle ‘necklace’ resides within the educational material of the entomological collection of the Iziko South African Museum (iSAM) in Cape Town, South Africa. 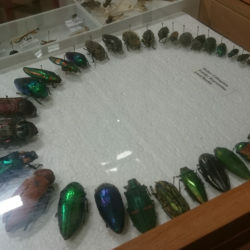 Margaret Cochrane, collections manager of the entomology collection of the South African Museum in the 1990s, made the jewel beetle ‘necklace’ by organising a selection of jewel beetle specimens into the arrangement. The arrangement is especially effective with larger specimens to one end (the more ‘frontal’ end) and gradually becoming smaller around the end that might sit at the back of one’s neck – typical of many necklace designs. What Cochrane hoped to demonstrate was the beauty of insects and their jewel-like qualities. 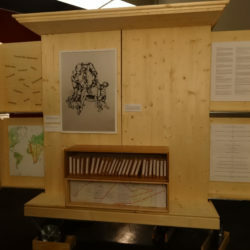 The ‘necklace’ was exhibited along with a few other insects in an exhibition called Nature’s Gifts, at the Cape Town International Conference Centre from 2004 to 2007. 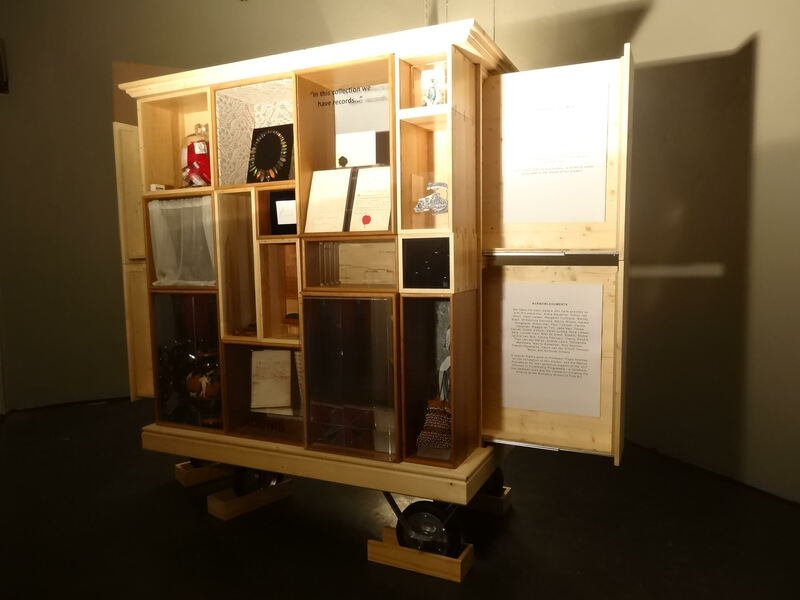 The exhibition statement called for an appreciation of the beauty and usefulness of nature and organisms in a world where they are often ignored or destroyed. Beetle wings and other exoskeleton parts, often those brightly coloured and iridescent, have long been collected and traded. Members of the Buprestids are a rich source of protein and have been harvested for sustenance in different parts of the world including South Africa. This probably led to the use of the discarded wings, which are not typically eaten, for use in art, craft and bodily adornment. Rivers and Klein cite examples of historic and some contemporary uses of colourful beetle wings in Japan, India, Highland New Guinea, Amazonia, Thailand, Myanmar or Burma, England and other parts of Europe, Mexico, and parts of Central America. Historically, Akyab in the Arakan district of Myanmar, or Burma, was the source of beetle wings, the locale at which harvesting occurred. The wings were then transferred to Calcutta for further distribution. The Cyclopedia of India of 1885 lists beetle wings as an item of commerce and gives an indication of the large volume of wings that were collected each season. It seems that commercial harvesting of beetles for their wings still occurs in current times, the market of which is said to be in Bangkok. 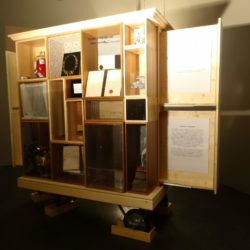 The use of animals, or their products, as art media (in terms of inspiration, collaboration, or as literal mediums) is a well-established practice throughout space and time. A notable mention is the work of sculptor Hubert Duprat, who has employed the skills of caddisfly larvae. By replacing the river sediment and organic material the insect larvae usually uses with precious materials like gemstones, pearls and flakes of gold to make repairs, Duprat and the caddisfly collaborate for the construction of a bejeweled cylinder, a process which has also been used in the jewellery industry. According to Klein (2002: 176), “the most prevalent, ubiquitous form of animal life incorporated in artwork is found within the phylum Arthropoda.” Predictably, the wings of beetles are cited as commonly used, especially those of buprestids and scarabs. Just two examples will be mentioned here. The miniature paintings of the Basohli School in India incorporated iridescent beetle wings to represent jewels in their art from around 1690 to 1730. Work of the contemporary artist Jan Fabre reveals the continued availability of the wings of certain buprestid species for commercial purchase, some the by-products of Southeast Asian restaurants. Covering the barrel vault and ceiling niches of a grand hall at the Royal Palace, Brussels, Fabre’s Heaven of Delight (2002) consists of immense, mosaicked constructions made with millions of iridescent wings. Much of what is documented on the use of beetle wings, in the aforementioned areas of the world, concerns textiles. Generally the wings are incorporated into embroidery, fixed with thread through small holes made in the hard plate, or held under webs or grids of thread. Impressive examples of beetle wing embroidery work, made with precious metals, can be found in the Mughal era (16th – 18th century India). These garments were for royalty, due to their expensive materials and intricate workmanship. Textiles like these influenced European clothing of the 1800s. The Great Exhibition of the Industry of All Nations in 1851 in London had a lace dress on display, “in which part of the pattern [was] composed of entire beetle wings stitched onto the dress in leaf and flower motifs,” says Rivers. Mentions of other such examples exist, and it seems that artisans in Europe and India produced them. A small industry arose in Indian cities producing fabric of embroidered metal threads and beetle wings for sale to Europeans. Tolini also presents examples of western style dresses of white fabric adorned with iridescent green beetle embroidery, made in England from imported Indian fabric in the 1840s and 1850s. The subject of jewellery within this inquiry of arthropod adornment can bring about stranger and frequently sinister materialisations. Flannery states that “jewellery in the form of organisms, particularly animals, is ubiquitous among human cultures over space and time.” Owing to the object of this discussion, of interest here is the real specimen, not a representation thereof. Jewellery incorporating beetle wings is likely to be as common and geographically spread as beetle-embellished textiles. Rivers describes how the Shaur people of the Peruvian and Ecuadorian Amazon make numerous beetle ornaments, one of which is long earrings with wings that “curl under slightly, so that when tightly strung together, the ornaments form a cylindrical curl of wings.” Beetle wing jewellery is also made in a contemporary westernised space, as the wings can be bought or ordered online as craft material. Whole insects set in resin as pendants, or the like, are a more unorthodox item of jewellery. The wearing of live beetles is practiced (possibly resurfacing for the tourism industry after dying out in the past) in the Yucatan Peninsula of Mexico. According to Klein, these beetles are not always colourful or iridescent, in which case they are adorned with jewels and precious metals. In the 19th century, “real organisms as ornament” were in vogue in Europe to the extent that there were “live beetles tethered to golden chains climbing on ladies’ shoulders” says Flannery (2007: 46), and Tolini cites the occurrence of fireflies fixed into hairstyles. The use of animals and animal parts for adornment in the Victorian Age was popular, including such items as hummingbird earrings made from the heads or bodies of the birds. Tolini investigates the transformation, in the later half of the nineteenth century in Europe, of animate organisms, particularly ornithological and entomological, into objects of ornament. The proliferation of animalistic ornamentation appears to have occurred with a growth of interest in natural history museums. Bodily ornament of the period took a number of forms, one of which was the hat, which had become more associated with decoration and style than with function. Tolini describes “animal-laden” hats and bonnets with assemblages of butterflies, flowers, bird nests, hummingbirds, mosses and beetles such as “preserved scarabs atop coronets of velvet” as millinery ‘trimming.’ The use of taxidermied animals only served to emphasise a constructed notion of nature that was transferred into a domesticated, ornamental realm. According to Tolini much of the inspiration and material for this trend came from Brazil, but also Africa, Columbia and India. The use of animals extended beyond millinery to the macabre jewellery featuring iridescent hummingbirds with incredible jewel tones (“flying gems”), which were featured in a range of ornamental objects. A 2011 exhibition, Fashioning Feathers: Dead birds, millinery crafts and the plumage curated by Merle Patchett and Liz Gomez, explores the complex geographies of hunting, sweatshop processing and wearing of exotic feathers. The demand for birds and feathers damaged bird populations, but it seems that ultimately it was changing tastes for more functional, less decorative dress that brought an end to the craze. Millinery, birds and jewel beetles are also to be found in the contemporary fashion collections of the house Alexander McQueen. A striking connection can be made between the jewel beetle ‘necklace’ of iSAM and the work of McQueen. There are also similarities and references to the animal-laden millinery of the Victorian Age. Lee Alexander McQueen (1969-2010), a British fashion designer, was renowned for dramatic shows and equally dramatic clothes, which were sometimes inspired by nature. Often an exploration of “the relationship between the beautiful and the grotesque” according to Bolton (2011: 15), the work of McQueen and his successor Sarah Burton has employed animal form, pattern and, in past collections, animal parts like bird skulls, feathers and bird taxidermy in the creation of garments and ‘hats’ or headpieces. McQueen’s final show Plato’s Atlantis (Spring/Summer 2010) proposed a future in which rising sea levels would necessitate humans to evolve to live as sea creatures drawing on 19th century theories of evolution and global warming theories of the 21st century. One particular look in the collection, inspired by the form of a jellyfish, is covered with scales (‘paillettes’ or sequins) that mimic the iridescence of jewel beetles and hummingbirds. The work of Burton since 2010 is of significance here for its marked insect inspiration. A collection in 2013 was entirely inspired by bees, and a recent collection (Autumn/Winter 2018) has imagery of beetles, including prints of the Goliath beetle and many encrusted and embroidered jewel beetles. The jewel beetle garments in particular are worth comparing with the iSAM jewel beetle ‘necklace,’ for the clear intent of decoration in the McQueen clothes enables one to consider the link to adornment in the ‘necklace.’ The two objects are dissimilar in that one is an imitation of jewel beetles – an artifice, and the other is ‘made’ of real insects. What is interesting about this ‘necklace’ of jewel beetles, is not only its allusion to the subject of insects and other animals in art, craft, textiles, jewellery and all manner of adornment, but also the illusion, or semblance, of the beetles as a necklace. The object is not an actual necklace but simply a display of pinned beetle specimens, however, they are arranged in an unusual way – that which invokes a piece of jewellery. Unusual because scientific beetle specimens are frequently displayed in ordered rows that might delineate their evolutionary history and familial, or species, relations. 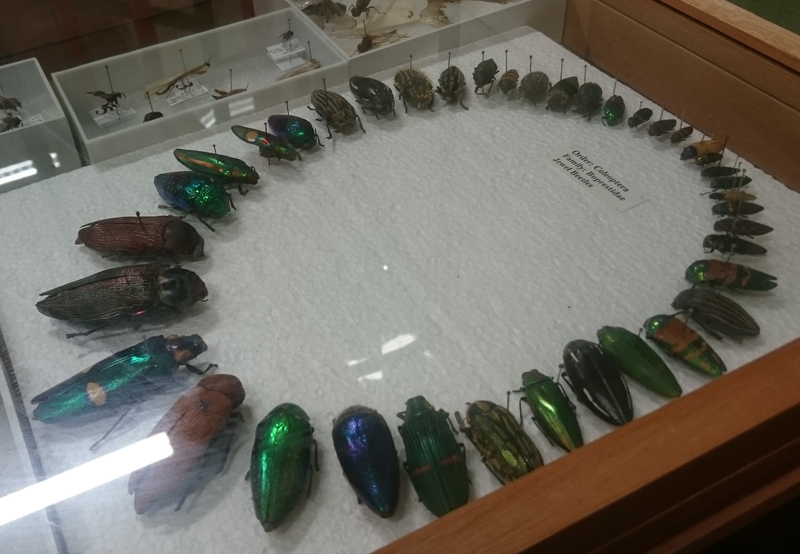 This display does group together members of a single family – Buprestidae or jewel beetles, but their arrangement is from smallest to largest, not by physiological or evolutionary similarity within the family. The arrangement is clearly artful; of priority is signalling the aesthetic qualities of the beetles and suggesting the artform of jewellery. 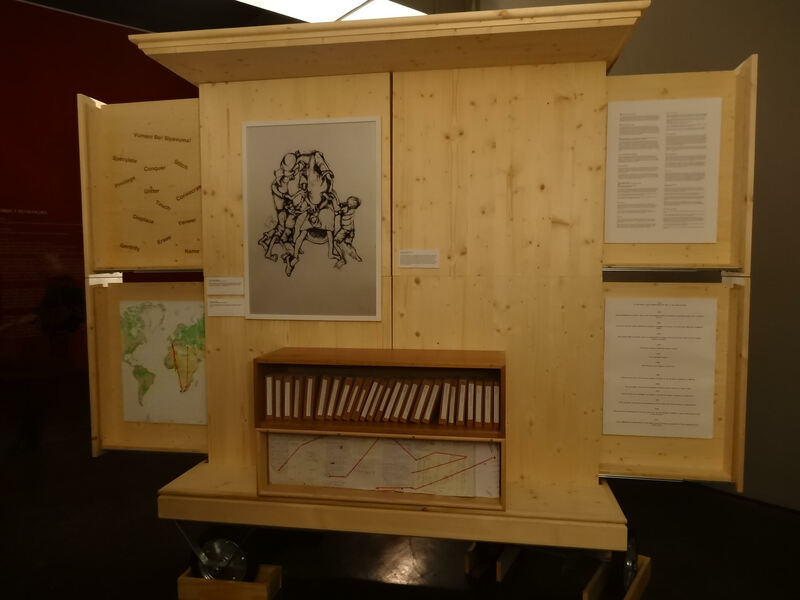 While scientific entomological displays are often beautiful in some way, their purpose is not to be beautiful but to showcase diversity and taxonomic order. This necklace represents a meeting point between the worlds of artistic creativity and scientific order. This window into two interconnecting worlds was opened through tactics of display. The use of insects and other animals in bodily adornment and fashion – another form of display – illustrates and animates some of the ideas indicated by the jewel beetle necklace. Aloi, G. Ed. 2007. Insect Poetics Part 1. Antennae: The Journal of Nature in Visual Culture. 3(A). Available: http://www.antennae.org.uk [2018, October 10]. Aloi, G. Ed. 2007. Insect Poetics Part 2. Antennae: The Journal of Nature in Visual Culture. 3(B). Available: http://www.antennae.org.uk [2018, October 10]. Aloi, G. Ed. 2009. Insecta. Antennae: The Journal of Nature in Visual Culture. 11. Available: http://www.antennae.org.uk [2018, October 10]. Aloi, G. Ed. 2012. Alternative Ornithologies. Antennae: The Journal of Nature in Visual Culture. 20. Available: http://www.antennae.org.uk [2018, October 10]. Bolton, A. 2011. Alexander McQueen: Savage Beauty. New York: The Metropolitan Museum of Art. Bradley, L. 2012. The McQueen Bee. Available: http://origin.anothermag.com/fashion-beauty/2292/the-mcqueen-bee [2018, September 15]. Bradley, L. 2013. World of Bees: Alexander McQueen Accessories S/S13. Available: http://www.anothermag.com/fashion-beauty/2604/world-of-bees-alexander-mcqueen-accessories-s-s13 [2018, September 15]. Cochrane, M. 2006. Nature’s Gifts: An exhibition at the Cape Town International Conference Centre, 2004-2007. Available: http://www.biodiversityexplorer.org/beetles/buprestidae/natures_gifts/index.htm [2018, September 15]. Daston, L. and Katharine, P. 2001. Wonders and the order of nature, 1150-1750. New York: Zone Books. DeMello, M. 2007. Encyclopedia of Body Adornment. Santa Barbara, California: Greenwood Press. Flannery, M.C. 2007. Weeds on the lapel: Biology and Jewelry. The American Biology Teacher 69: 44-47. DOI:10.2307/4452081. Gleason, K. 2012. Alexander McQueen: Evolution. New York: Race Point Publishing. Klein, B.A. 2002. Par for the palette: Insects and arachnids as art media. In Les insectes dans la tradition orale – Insects in oral literature and traditions. É. Motte-Florac & J.M.C. Thomas, Eds. Leuven, Belgium: Peeters Publishers: 175-196. Patchett, M., Foster, K., Gomez, L. and Roe, A. 2010. Ruffling Feathers: Exhibiting the Monstrous Geographies of the Plumage Trade. Antennae: The Journal of Nature in Visual Culture 20: 27-54. Available: http://www.antennae.org.uk [2018, October 10]. Rivers, V.Z. 1994. Beetles in Textiles. Cultural Entomological Digest. 2. Available: https://www.insects.orkin.com/ced/issue-2/ [2018, September 15]. Rivers, V.Z. 2002. Emeralds on wing: Jewel beetles in textiles and adornment. In Les insectes dans la tradition orale – Insects in oral literature and traditions. É. Motte-Florac & J.M.C. Thomas, Eds. Leuven, Belgium: Peeters Publishers: 163-174. Rivers, V.Z. 2003. The Shining Cloth: Dress and Adornment that Glitters. High Holborn, London: Thames & Hudson. Simons, M. 2003. Bits of bugs glow, to delight a queen. The New York Times. 4 February. Available: https://www.nytimes.com/2003/02/04/arts/bits-of-bugs-glow-to-delight-a-queen.html [2018, September 15]. Tolini, M. 2002. “Beetle abominations” and birds on bonnets: Zoological fantasy in late-nineteenth-century dress. Nineteenth-Century Art Worldwide. 1(1). Available: http://www.19thc-artworldwide.org/spring02/85-spring02/spring02article/206-qbeetle-abominationsq-and-birds-on-bonnets-zoological-fantasy-in-late-nineteenth-century-dress [2018, September 15]. Wilcox. C. 2015. Alexander McQueen. 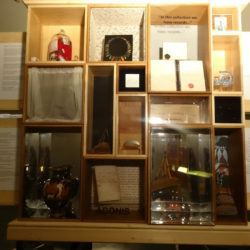 London: V&A Publishing. The following points are alternarrative points of reference in contextualising the beetle necklace as a suggested item of adornment. These are simply interesting locations or points of space and time not directly related to the movement of the object itself, but related to the story of jewel beetles and other desirable creatures in textiles, jewellery, adornment and art. Historically, Akyab in the Arakan district of Myanmar or Burma was the source of beetle wings, the locale at which harvesting occurred. The Great Exhibition of the Industry of All Nations in 1851 in London had a lace dress on display with green beetle wings inlaid in the embroidery. Artist Jan Fabre completes Heaven of Delight, consisting of mosaics made with millions of iridescent wings covering the barrel vault and ceiling niches of a grand hall at the Palace. Nature’s Gifts, Cape Town International Conference Centre, 2004 - 2007.